The four-cup capacity Cuisinart Mini-Prep Plus is a handy alternative to a full-sized blender, with enough power for small jobs and easy-to-clean features that will give it more use. The Mini-Prep will grind as well as chop dry ingredients, and has push button controls plus automatic reversal for the grinding option. The Mini-Prep makes quick spreads and dips with fresh ingredients and also prepares hard cheeses, nuts, hard chocolate, and seeds for use as fresh toppings You may need to stop the machine occasionally and scrape the walls of the container with the spatula provided in order to get a smooth mix. Many blenders will bog down if you don't get a liquid mix right, or if you overload the pitcher with harder items. If you sense distress in this little machine, shut it down and reconsider what you are doing. Motors generally burn out because of overloads. The small size is a definite advantage for most kitchens, saving ingredients as well as clean-up time. If you prepare food in small batches, you don't feel obligated to eat more than you should -- so if you watch calories, a small volume machine like the Mini-Prep is a great help. 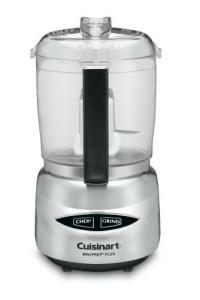 Want a food processor like this in a blender combo set?